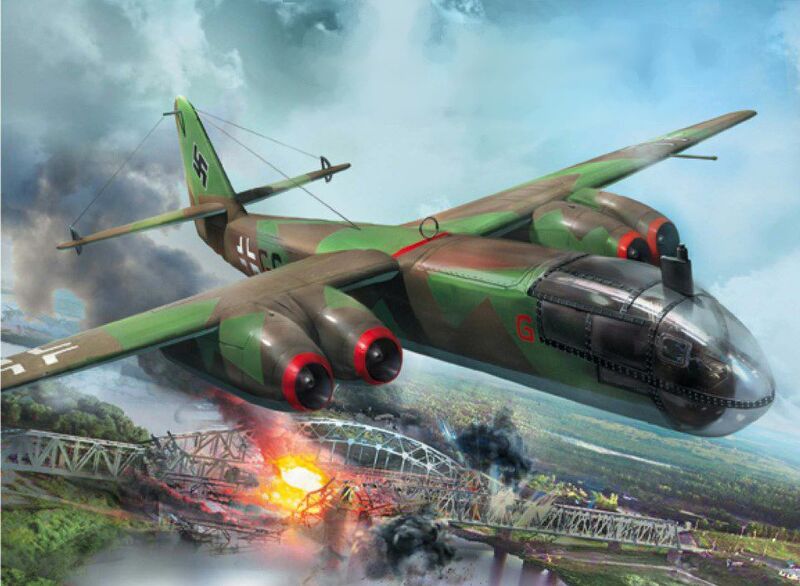 Designed by engineer Walter Blume as early as 1941, but first flown in July 1943, the Arado Ar 234 Blitz (“Lightning,” also known as the Hecht—“Pike”) was the world’s first operational high-performance, jet-engine medium bomber. This came not from one of the major manufacturers, but from a relatively minor company. Prior to the development of the Ar 234 Blitz the Arado company had only ever been involved in the production of light aircraft. Many of them, such as the Ar 196, were produced as floatplanes. In 1940 the RLM issued a specification for a high-speed reconnaissance aircraft to be powered by jet engine. 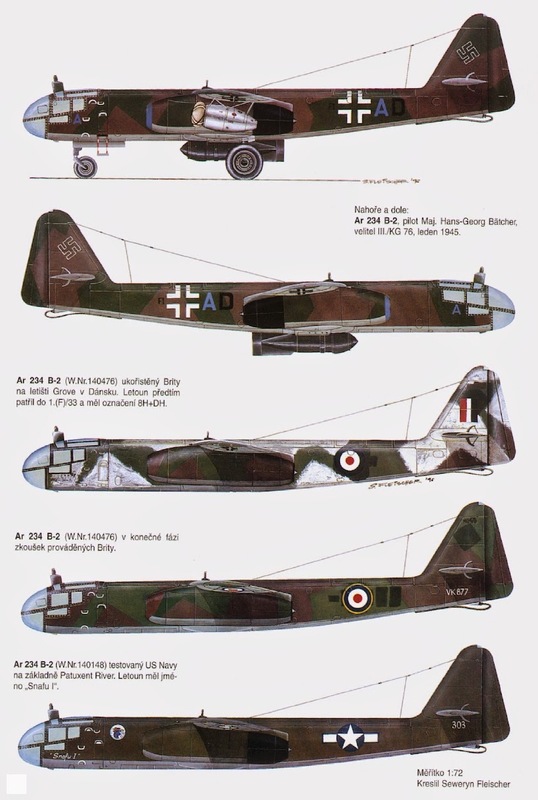 Arado’s response was the shoulder-wing monoplane Ar 234 (originally designated E 370). This had a crew of one pilot. The length of the thin fuselage was 12.6 m (41 ft 6 in), wingspan was 14.1 m (46 ft 4 in), height was 4.3 m (14 ft 1 in), wing area was 26.4 square m (284 square ft), and empty weight was 5,200 kg (11,500 lbs). The bomber’s design was conventional, neat and simple, but featured several innovations, including automatic pilots, landing- brake parachutes, and ejector seat, that are still used in military aircraft today. It was powered by two Junkers Jumo 004B-1 turbojets. Maximum speed was 742 km/h (461 mph), combat range was 800 km (500 miles), and service ceiling 10,000 m (32,800 ft). Armament included two rearward-firing, 20-mm MG 151 guns, aimed by the pilot through a periscope, but these were not always fitted. Two bombs of 500 kg (1,100 lb) or one of 1,000 kg (2,200 lb) or 1,400 kg (3,180 lb) could be carried. In the field, the Ar 234 was used almost entirely in a reconnaissance role, but in its few uses as a bomber—owing to its remarkable speed and high ceiling—it proved to be impossible to intercept. The aircraft, however, lacked fuselage volume for any bomb load, which was therefore carried externally. To reduce weight, early prototypes had no landing gear; they took off on a wheeled trolley, and landed on skids at the end of the flight. Such a landing arrangement was out of the question for operational purposes, so the improved bomber version, Ar 234B, that flew in March 1944, had its fuselage slightly wider to hold a retractable landing gear fitted with two main wheels and nosewheel. It made use of RATO (rocket assisted take-off ) and had an added bomb load. Twenty Arado Ar 234 Bs were produced and delivered by the end of June 1944. The only notable use of the plane in the bomber role was during the Ardennes offensive in winter 1944-45, and the most spectacular operational bombing mission was the repeated attacks by Ar 234 B-2s flown by III/KG 76 on the vital Ludendorff Bridge at Remagen in March 1945. The uninterceptable aircraft, though handicapped by fuel shortage, continued to see scattered front-line action for reconnaissance until Germany surrendered on May 8, 1945. 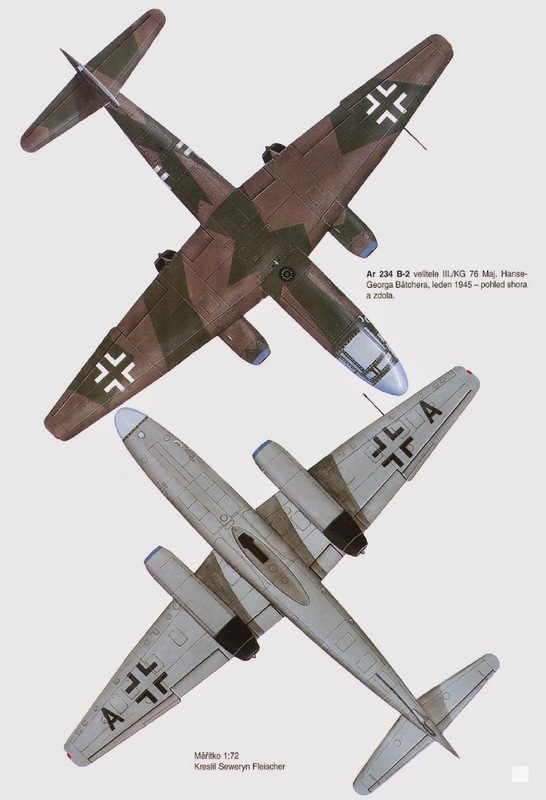 There was a planned improved version, known as Arado Ar 234C, powered by four BMW 003A engines. Fifteen prototypes of the Ar 234C were completed before the end of the conflict. 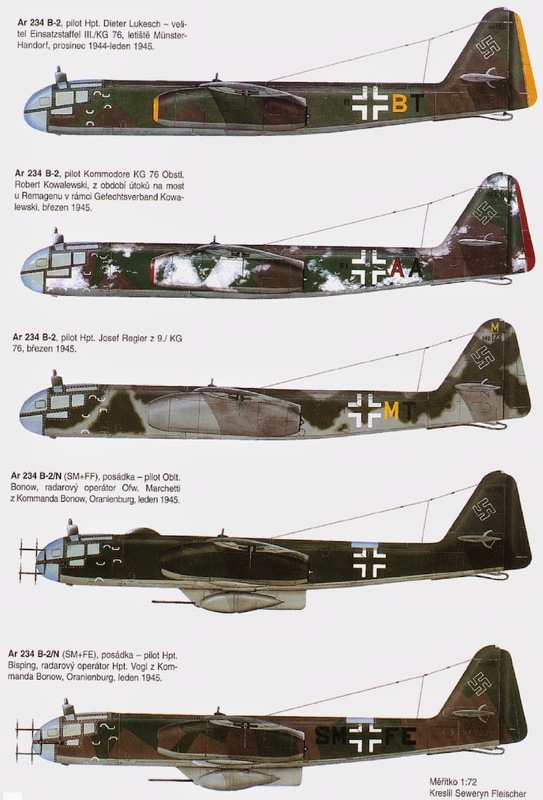 Although Hauptmann Diether Lukesch was preparing to form an operational test squadron, the Ar 234C was not developed in time to participate in actual combat operations.